Ferraras on drums was joined by a group of extremely talented musicians including Liam MacDonald on tambourine who did things I didn’t know were possible with a tambourine. Celso Machado was on guitar, also blowing us away with his incredible talent. 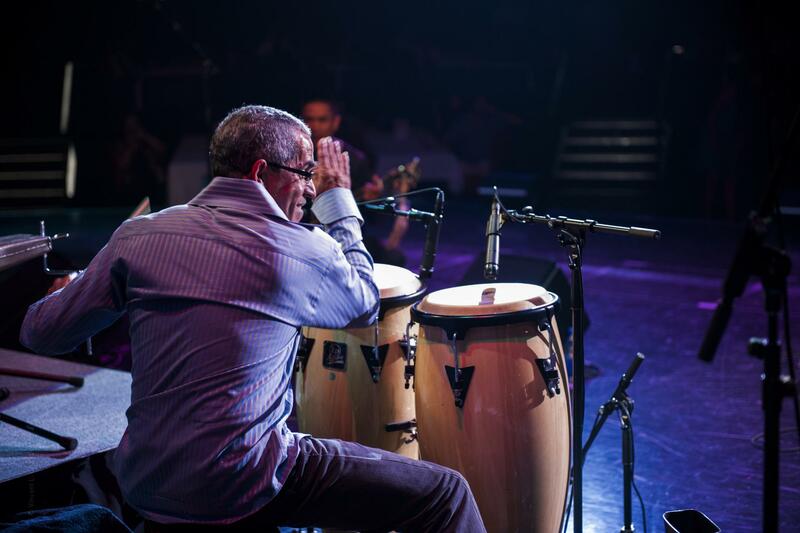 Cassius Khan treated us to the beautiful sounds of the table, and Israel Berriel’s thunderous voice accompanied his conga drums along with Raphael Geronimo’s timbale drums. Only two out of the fourteen featured musicians were women: Jodi Proznick fabulously playing the upright bass and Niho Takase beautifully playing the piano. The Sarabande choir joined the musicians for a few songs, adding their subtle harmonies to the mix. Perhaps the best moment of the show came at the finale — a salsa inspired rendition of Michael Jackson’s “Billie Jean” sung by Sarabande’s Aerhyn Lau along with a few backup singers from the choir. It may not sound like MJ and salsa music go together, but these musicians made it work beautifully. It was impossible not to tap your feet or do a bit of chair dancing as these musicians shared their love of music with the audience.